In the early years of our marriage it was not at all unusual for my precious INTP husband to have the fabulous idea of hosting a lot of really hungry people approximately 15 minutes before the suggested meal would need to be on the table. Clearly, I married him because he’s fun and spontaneous like that, but the ESFJ in me is also rather fond of a plan. These days, we still enjoy hosting people in our home, but know that it takes a bit more forethought, so we’ve tried to get it down to a science so that with a day’s notice we can feed the hungry people something other than Little Caesars. 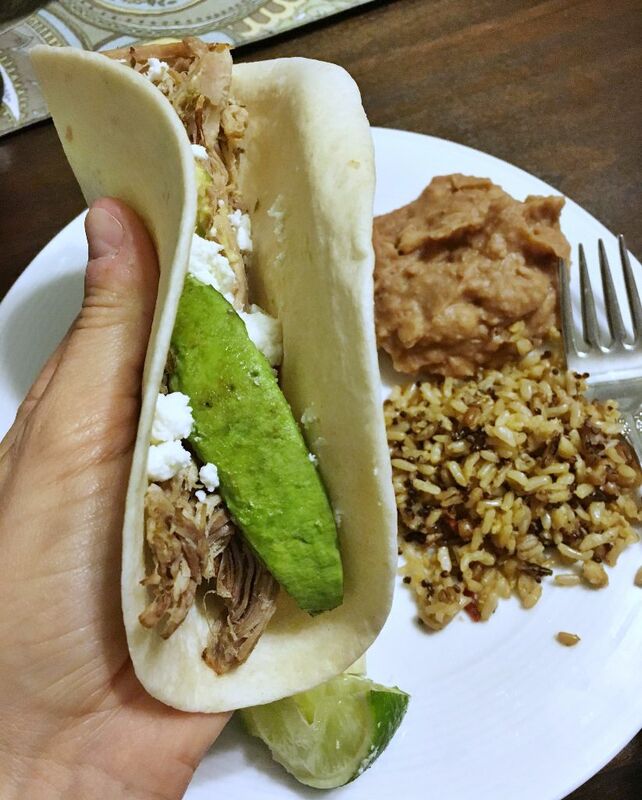 By far, the best thing that’s come out of my crockpot this week was the pork carnitas we made on Monday. This recipe is simple to prepare and has flavor for days. So, next time you need to prepare a meal of the masses, or just want leftovers to freeze, here ya go. Rinse and dry the pork shoulder. In a small bowl, combine olive oil, chili powder, cumin, oregano, salt and pepper. Season pork shoulder with spice mixture, rubbing in thoroughly on all sides. Place seasoned pork shoulder, garlic, onions, orange juice with orange peels, lime juice with lime peels, jalepeno and into a slow cooker. Cover and cook on low heat for 8 hours or high for 4-5 hours. Once the meat is tender, remove pork shoulder from the slow cooker and shred the meat then return to the pot with the juices; season with salt and pepper, to taste, as needed. Cover and keep warm for an additional 30 minutes. Preheat oven to broil. Place carnitas onto an aluminum foil lined baking sheet and broil until crisp and crusted, about 3-4 minutes. Serve immediately with avocado, *lots of lime juice* (key to making your mouth sing!!) and crumbled goat cheese. These also make UNBELIEVABLE quesadillas. We ate them as leftovers and were delighted that the next night they were even yummier! Enlist helpers to cut these times and delegate dessert to a guest! People love to bring something. Tidy living space + wipe downbathroom-10 min. Shauna Niequist has a wonderful keynote talk about hospitality that you should totally listen to! In it, she says her main advice for cleaning before company arrives is to grab the baby wipes and a laundry basket then fry a pound of bacon. In other words, wipe away anything sticky or icky, toss anything that would trip or injure a guest (LEGOS!) and create a wonderful aroma in the air that says, “oh, I’ve been planning on you coming for days…” So tidy! And make it quick. Set out chips, salsa and cheese dip-3 min People will want something easy to much on because though they are excited, often they are a tad nervous to come over. Warm beans + Rice-5 min Any can of refried beans will do and if you want my opinion the Seeds of Change 7 Whole Grain microwavable rice pouches from Walmart are amazing. Mix salad-5 min I use the “Kale Yeah” pre-prepared salad bags from Walmart. 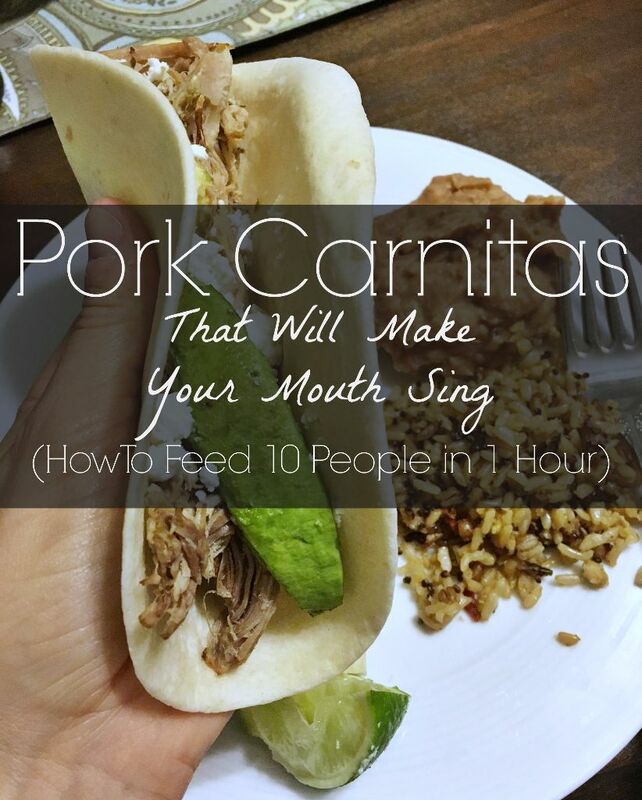 The Southwest Salad Kit is amazing with these carnitas. It’s more of a slaw than anything and it’s so good! If you want to get real fancy you could have a jar filled with conversation starters or you could play our favorite dinner party game. The sky is the limit, but if you have an hour to make it happen (and you had enough warning to get the meat in the crock pot!) Then you can make it happen!! Woot! If you’d like a printable shopping list just sign up here and I’ll send it to ya! I think I like eating at your house…more interesting than mine. Yum! Going to make this this week! YUMMERS! Have you tried it with cojita cheese or just goat? Wish I could’ve had you for supper for real!! Bahaha, girl, cojita is full on Walmart cheese! I just need to send you to the right part of the store.